Waiting [ QuickTime 5.06 MB ] - Lauren Feldman is featured in this video, edited by Steve Garfield, from footage that was shot by Mark Wuerthner. The concept and design was initially used for an orginal video by Adam Grinovich called Looking Glass. When I was little, I used to get seven presents, one for each night of Hanukkah. 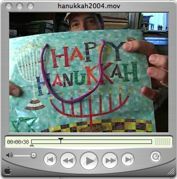 In this video, I'm happily wrapping my mom's Hanukkah presents to the music of Oy To The World, A Klezmer Christmas. Thanks to Paul Libman of Libman Music for allowing me to use this song in my video. My Mom's Blog - at 79 years young, the Internet's oldest blogger. Wil Wheaton - Just A Geek.